Much like the men’s race, the 2014 New York Marathon women’s race was an epic battle that went straight to the last few metres. In the end, Mary Keitany outkicked compatriot Jemima Sumgong to win in 2:25:07. Sumgong was only 3 seconds behind. Keitany, 32 had never won the New York Marathon before. Her last major victory was at the 2012 London marathon. World champion, Edna Kiplagat finished a disappointing 13th, perhaps unable to cope with the cold conditions (45 Fahrenheit, 7 Celsius). 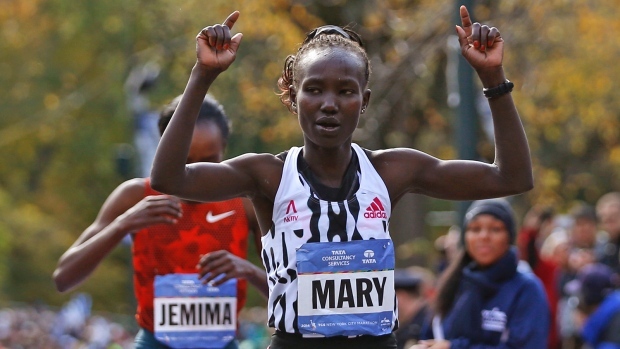 This entry was posted in Kenya Athletics News, Kenya Sports news and commentary and tagged jemima sumgong, mary keitany, New York Marathon. Bookmark the permalink.